Chris Burke, Emerson Automation Solutions, UK, explores how continuous, real-time corrosion monitoring has extended the life of a mature natural gas field in the North Sea. With margins squeezed, natural gas producers in every region are focusing on maximising output from existing assets by doing more with less. However, as gas fields mature, their infrastructure often requires monitoring and rehabilitation to prevent gas leaks and dangerous consequences. Figure 1. Mature upstream assets, such as offshore platforms, experience more corrosion problems as they age. Corrosion and erosion are growing problems for the upstream oil and gas industry (Figure 1), and a proactive approach to monitoring is key to maintaining safety and profitability in mature fields. This article will consider natural gas field corrosion, and show how to monitor it continuously to extend asset life. To maintain the economic viability of their offshore assets, operators of mature gas fields are looking to reduce operating expenditures by increasing the number of unmanned installations. This can involve the removal of compression and/or gas drying capabilities on previously manned offshore platforms, and repurposing larger assets to handle wet gas instead of dry. As a field matures, additional wells are often drilled and brought on-stream to maintain production capacity. Sometimes this results in local bottlenecks, with existing facilities modified to maintain throughput. The situation can be complicated further by additional modifications required to keep the gas flowing from existing wells as the pressure falls off toward the end of economic field life. For example, compressors can require changes in their input stages to work with lower arrival pressures, resulting in additional rerouting to avoid flow-back conditions. Some assets were originally designed to handle a certain type of input. Take a gas well for example. During early production, the throughput is generally dry, and the metallurgy of the equipment would have been selected accordingly. However, as the reservoir depletes, it tends to produce more corrosive liquid and solid substances. If wet sand is being pulled through a pipe originally designed and installed to handle dry gas, this can have a significant impact on the erosion of the pipe wall. Reconfiguration work, combined with the increasing volume of formation water typically produced from ageing wells, requires a robust corrosion management strategy. 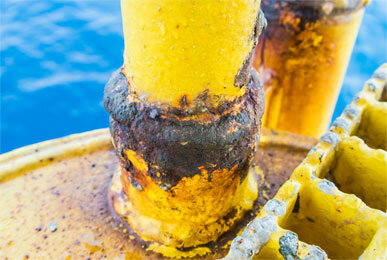 If left undetected and unchecked, corrosion can have a major negative impact on asset integrity, resulting in expensive repair work or even loss of hydrocarbon containment – with possibly catastrophic environmental, safety, financial and reputational implications. Corrosion monitoring and control is therefore essential to manage risks effectively. To accomplish this, operators need tools and data that can deliver insight and actionable information to achieve the desired outcomes, as demonstrated in the following application. A Dutch gas company wanted to extend the life of a major production platform in the North Sea. One of the main technical challenges was repurposing the existing dry gas facility to handle wet gas from adjacent assets, and managing the subsequent corrosion risk. The company has been operating in the North Sea since 1975, and the operation includes two large hubs receiving gas from a number of satellite platforms. The two hubs feed the gas into a principal platform. Over the last decade, the operator has implemented a strategy to extend the economic life of its producing assets by consolidating existing infrastructure and streamlining operations. As this is a mature field, declining production and rising operational costs needed to be balanced with maintaining the integrity of the assets and the associated infrastructure. As part of the consolidation process, the principal platform was reconfigured to handle wet gas from the adjacent wells. Maintaining asset integrity – and therefore optimum output and safety – was the absolute priority, but this created a number of new technical challenges, particularly controlling corrosion. The carbon steel pipework transporting hydrocarbon gas between the principal platform and each of its sister facilities was originally designed to handle dry gas. The challenge with wet gas is that the water phase is acidic because it contains CO2 and organic acids. Therefore, corrosion was a particular concern from the outset. To address this risk, various equipment and valves were replaced with corrosion-resistant alloys. However, it proved too complex and expensive to replace the existing carbon steel piping infrastructure, and this would have almost certainly rendered the project uneconomical. The operator needed to find a way to operate safely within the limits of the existing infrastructure. Part of the solution included improvements to the existing chemical corrosion inhibition strategy by providing additional corrosion inhibitor injection points. However, there is a very fine balance to strike: if excessive corrosion inhibitor is added without sufficient liquid water in the stream, the raw inhibitor is itself corrosive to carbon steel. So, corrosion inhibitor injection needed to take place only when the process fluid reached certain levels of wetness. If too much inhibitor was added too early, this could actually increase the risk of corrosion instead of mitigating it. To achieve the balance required, the well operator first tried intrusive probes to monitor the effectiveness of the corrosion inhibitor. These probes protrude into the flow and gauge the corrosivity of the fluid by measuring corrosion of the probe’s sacrificial element. The crucial drawback of such a system is that it can only infer corrosion levels. What the probes are actually measuring is the loss of metal from the sacrificial element of the probe itself. The corrosion rates of the pipework are then estimated from the corrosivity measurements. Estimating, though, is not the same as measuring, and the operator needed more accurate insight into the levels of corrosion in its pipework, and in more locations. The more complete the picture, the more confident the operator could be of the safety and integrity of the asset. There is such a thing as best practice with inhibitor levels, but there are so many uncontrolled variables that it is an inexact science. It is perfectly possible that the chemicals are within recommended levels, but excess internal corrosion is still occurring. In that case, the gas field operator either has to invest resources to perform frequent manual checks, or risk discovering the problem when it is too late. The way to avoid this is direct measurement. Figure 2. 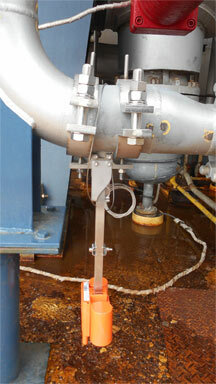 Emerson's Permasense wireless ultrasonic thickness measurement sensor installed on the platform. An existing chemical inhibition strategy was enhanced to mitigate corrosion. As part of the improved strategy, Emerson’s Permasense™ wireless ultrasonic thickness measurement sensors were installed to monitor metal pipe wall loss at critical locations (Figure 2). This allowed the operator’s corrosion management team to view the wall thickness data in real time and, if necessary, modify the inhibitor injection rates to ensure safe operation of the platform without any interruptions to production. Improving the wet gas handling capabilities of the principal platform made it possible to simplify the associated hubs and satellite platforms, which reduced the need for onsite manning. Corrosion monitoring systems employ ultrasonic wall thickness measurement principles. These sensors are affixed to the external surface of the pipework to determine the thickness of the pipe wall by continuously monitoring for metal loss at critical locations. The technology is non-intrusive and wireless, meaning it can be installed while assets are on-stream, and without expensive cable runs to retrieve the data. This solution also offers users the flexibility to deploy sensors in any required configuration, from close set in arrays at critical points, to widely dispersed in other areas. Without these types of sensors, the only way to access this level of information is for inspection teams to collect corrosion data manually – substantially increasing costs and safety risks associated with accessing pipework. A system to continuously and wirelessly transmit corrosion data back to the operator was therefore the most operationally effective and commercially attractive option for the Dutch gas field as described above, and in many other similar applications. The final solution employed at the Dutch gas field included 30 WT100 wireless thickness sensors. Corrosion monitoring locations were selected in high risk areas of the pipework, and sensors were installed to give the well operator continuous, accurate insight into the actual levels of corrosion occurring. Once installed, the sensors wirelessly transmitted accurate data via a gateway to a networked server loaded with Emerson’s Permasense Data Manager software. The software’s visualisation interface (Figure 3) allowed the operator’s onshore-based corrosion management team to quickly access the data from their desks, identify changes in corrosion rates, and take remedial action to ensure continual, safe operation of the platform. Figure 3. Emerson's Permasense Data Manager software displays a corrosion measurement graph. The sensors detected elevated corrosion rates in some of the flow-back lines, downstream of the first and second compression stage. Flow-back lines are particularly vulnerable to internal corrosion due to the variable and often low flow rates, which can allow water to gather and increase local corrosion activity. For this reason, the operator had installed several sensors in these areas of elevated corrosion risk. The operator deliberately left the valves on these lines slightly open to encourage adequate flow rates, and provided replenishment of corrosion inhibitor through these lines to mitigate the elevated corrosion risk. However, the sensors allowed the operator to see that these measures were not enough to adequately control corrosion rates in the flow-back lines. By directly measuring wall loss rather than just the chemistry of the fluid, the corrosion monitoring system can catch elevated corrosion rates causing a significant negative impact on the integrity of the asset before they become too serious. Moreover, operators can quickly understand and address the underlying issues because the data is accurate and delivered in real time. The installation of the corrosion monitoring system removed the need for guesswork. Data quality improved, and the continuous frequency of measurement allowed the well operator’s personnel to monitor changes to wall thickness as they occurred. As a result, personnel can now rapidly and continuously monitor how the infrastructure is responding to all the unpredictable and uncontrollable variables affecting internal corrosion within the upstream environment. The company now has the tools to monitor the effects of an unexpected change in these uncontrolled external variables, assess the precise effects of corrosion inhibiting strategies, and adjust them as necessary. The installation of the corrosion monitoring system ultimately enabled the operator to maintain safe and profitable operations at this mature gas field. With continuous ultrasonic corrosion monitoring, the Dutch company is now in a far better position to monitor the integrity of its upstream assets. This means an instant saving on expensive manual inspections, and a long-term gain in enhanced asset reliability and availability. Automated monitoring of asset integrity combined with appropriate data analysis also gives the Dutch operator the confidence to drive its assets harder within appropriate parameters, potentially enhancing revenue. While every project comes with its own specific challenges, the drivers behind this Dutch company project are hardly unique. Whether converting from dry to wet gas flow, handling reduced pressure from ageing wells or removing bottlenecks – similar challenges can be found across the gas industry. The changing nature of natural gas from mature fields often leads to elevated corrosion if preventative measures are not taken. Well field operators are using various methods to increase the useful life of an ageing gas field, such as adding inhibitors, but undetected and unmeasured corrosion complicates the situation. A method to continuously measure corrosion in key areas is needed to allow gas field operators to adjust inhibitor levels accordingly. By having a direct measurement of corrosion occurring at the wall of the metalwork – rather than just of the levels of inhibitor in the flow or the corrosivity of the fluid – operators can have confidence in the readings, meaning fewer manual inspections and unhampered production. Continuous system feedback means operators can adjust for and eliminate certain variables to swiftly address any underlying problems. Wireless, non-intrusive ultrasonic corrosion sensors provide minimal costs for installation, maintenance and replacement – and the replaceable battery for each sensor provides two and a half years of maintenance-free operations. Combining continuous corrosion monitoring with a plan to address detected deficiencies allows mature gas fields to continue operation in a cost-effective and safe manner for many years.